You can listen to Rafiq’s reading here. Rafiq Kathwari is the first non-Irish recipient of the Patrick Kavanagh Poetry Award, in the forty four-year history of the award. He lives in Ballyoonan (Baile Uí Mhaonáin), County Louth, but has lived most of his adult like in New York. Born, as he puts it, “a Scorpio at midnight” in the disputed Kashmir Valley, Rafiq has translated from the original Urdu selected poems of Sir Mohammed Iqbal, one of the handful of great South Asian poets of the 20th century writing in Urdu. Rafiq obtained an MFA in Creative Writing at Columbia University and a Masters in Political and Social Science from the New School University. He divides his time between New York City, Ireland and Kashmir. In Another Country (Doire Press, 2015) is his début collection. The Memory of the Present features poetry and music reflecting on the centenary of the rising, with Biddy Jenkinson, Thomas McCarthy and Rónán Ó Snodaigh. The evening will also include projections of silent footage from the era. Biddy Jenkinson is interested in the maintenance of bumble bee habitat in Wicklow. Her pen name is a gesture of obeisance towards An Bhé /The Muse. She writes poetry if she can and if she can’t, turns to detective fiction, short stories and if that won’t work plays (badly) tin whistle or paints or gardens or cooks – believing that all these activities are related. Since 1987, several collections of Jenkinson’s poems and short stories have been published by Coiscéim, her latest being Táinrith (Coiscéim, 2013). Coiscéim a d’fhoilsigh a saothar. An leabhar is deireanaí dá cuid Táinrith (2013), ath-insint ar Tháin Bhó Cuailnge. D’éirigh go maith le scéalta bleachtaireachta dá cuid. An tAthair Pádraig Ó Duinnín, foclóirí, a bhíonn ag bleachtaireacht. Beidh cnuasach nua filiochta dá cuid ‘Trí Bhanúlacht na Sceilge’ á fhoilsiú ag Coiscéim go luath. Thomas McCarthy was born at Cappoquin, Co. Waterford, in 1954 and was educated at University College Cork. He won the Patrick Kavanagh Award in 1977, the Alice Hunt Bartlett Prize in 1980 and the O’Shaughnessy Poetry Prize in 1991. He was a Fellow of the International Writing Programme, University of Iowa, 1978/79 and Visiting Professor of English at Macalester College, Minnesota, 1994/95. A former director of writing workshops at Listowel Writers’ Week, Arvon Foundation and Portlaoise Prison (Provisional IRA wing), he was a public librarian in Cork for many years and is a member of Aosdána. He has been published and anthologised in numerous publications and is the author of two novels and nine books of poetry, his most recent being The Last Geraldine Officer (Anvil Press Poetry, 2009). His new collection Pandemonium is forthcoming from Anvil Press. Musician and poet Rónán Ó Snodaigh was born on the first day of 1970 in Dublin, Ireland. He was brought up in an Irish speaking family (Gaeilgóir) in the English speaking world of south county Dublin, being dually influenced by the Gaeilge revival culture of his artist and writer parents and the steady flow of the US and English pop cultures. He spent his summers in the west Kerry gaeltacht of Chorca Dhuibhne. A founding member of Ireland’s most celebrated world music band Kíla, Rónán is one of Ireland’s best and most innovative bodhrán players and a highly original singer songwriter. He has released some twenty albums to date, including ten with Kila, six solo and a number of others. Described by John Walsh (Hot Press) as ‘the living em-bodiment of Turlough O Carolan and Bob Marley’, and by a fan as ‘…The Jimi Hen-drix of Bodhrán’. Rónán mixes the Irish and English Languages, bluesy grooves with wild percussion and folk guitar to create his unique organic sound. The competition shortlist of twenty-eight films is online at www.obheal.ie/poetryfilm. These will be screened in two parts at the Blacknight Festival Centre, Kino Cinema on Washington St. The films were chosen from 163 submissions from 28 countries, completed in the last two years. This year the shortlisted entries represent fifteen countries: Ireland, USA, Australia, UK, Germany, Spain, Belgium, Ukraine, Canada, Israel, Italy, Estonia, Finland, Belarus and Portugal. The 2016 Ó Bhéal judges, poet Kathy D’Arcy and filmmaker / CEO of Film in Cork Rossa Mullin, will select one overall winner to receive the IndieCork festival award for best poetry film. You can listen to Scott’s reading here. Scott Jamison was born in Belfast in 1988 and studied at Queen’s University, Belfast. His poems have been published in Poetry Ireland Review, The Rialto and The Literateur. He has written and released music with Go Wolf. You can listen to Stephen’s reading here. Stephen Connolly was born in Belfast in 1989 and studied at Queen’s University, Belfast. His poems have been published in Poetry, Poetry Ireland Review and The Irish Review. He co-runs the Lifeboat, a reading series and small poetry press and is co-editor, with Sinéad Morrissey, of The Future Always Makes Me So Thirsty: New Poets from the North of Ireland. You can listen to Manuela’s reading here. Manuela Moser was born in Lancaster in 1992 and studied at Queen’s University, Belfast. Her poems have been published in tender, The Lighthouse and The Future Always Makes Me So Thirty: New Poets from the North of Ireland. She co-runs the Lifeboat, a reading series and small poetry press. You can listen to the reading here. Ó Bhéal hosts a celebratory reading for Salmon Poetry‘s 35th anniversary. A number of poets will be reading from Even the Daybreak; 35 Years of Salmon Poetry (ed. Jessie Lendennie), including Edward O’Dwyer, John W. Sexton and Sandra Ann Winters. For Matthew Geden’s review of Even the Daybreak; 35 Years of Salmon Poetry, click here. Jessie Lendennie was born in Arkansas, USA. She settled in Ireland in 1981. Her publications include a book-length prose poem Daughter (1988), reprinted as Daughter and Other Poems (2001) and Walking Here (2011). She compiled and edited: Salmon: A Journey in Poetry, 1981-2007; Poetry: Reading It, Writing It, Publishing It (2009); Dogs Singing: A Tribute Anthology (2010); and, Even The Daybreak: 35 Years of Salmon Poetry (2016). She is co-founder (1981) and Managing Director of Salmon Poetry. Her poems, essays and articles have been widely published and she has given numerous readings, lectures and writing courses in Ireland and abroad, including Yale University; Rutgers University; The Irish Embassy, Washington D.C; The University of Alaska, Fairbanks and Anchorage; MIT, Boston; The Loft, Minneapolis, MN; Café Teatre, Copenhagen, Denmark; the University of Arkansas, Fayetteville; The Irish American Cultural Centre, Chicago and The Bowery Poetry Club, New York City. She is currently working on a memoir To Dance Beneath the Diamond Sky. You can listen to Sarah’s performance here. 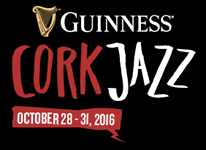 Ó Bhéal has hosted a jazz-poetry night every year since 2008 to coincide with the Cork Jazz Festival. It’s one of the series’ most popular events. The night begins as usual at 9.30pm with the five word challenge, followed by guest poet Sarah Clancy who will be accompanied by The Jazz Messengers. 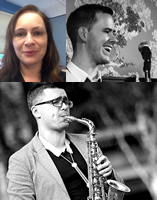 The Jazz Messengers are Brenda Griffin on Keyboard, Fionn O’Neill on bass and Sebastian Schneider on sax. The trio will also play improv to the later open-mic session, so feel free to bring and read your favourite poem and feel what it sounds like served up with jazz! You can listen to more from The Jazz Messengers here. Brenda Griffin (Keys) BA, MMus, ATCL, HDAPE, has had an active involvement on the Cork music scene over the past twenty years, predominantly as a performer and educator. She holds a Masters in Performance on the French Horn and worked as a brass teacher with the then VEC for a number of years, before qualifying as a primary school teacher. Brenda has performed with numerous local and national bands, playing piano, keyboards, trumpet and vocals, whilst continuing to compose, arrange and typeset music for various institutions throughout the country. Apart from her participation in music, Brenda is a dedicated mother to three young girls and is also a keen baker. Fionn O’Neill (Bass) is a singer, bassist, guitarist, songwriter from Dingle, Co.Kerry. Having played many gigs over the last few years with his original band Strange Attractor such as electric picnic, the sugar club and a tour of Germany. He is also the bass player of the Cork based wedding and function band Groove Collective . He is currently studying for his BA of Popular Music in the School of Music. Sebastian Schneider (Sax) BMus, MA, BSc, is active as a teacher and music producer. He is the founder of Spotlight Events, a music agency with a difference! Originally from Germany, Sebastian is a professional musician (Saxophone and keyboards) and also works as a freelance web & graphic designer and photographer in Cork. You can listen to Paul’s reading here. Paul Muldoon was born in County Armagh in 1951. He now lives in New York. A former radio and television producer for the BBC in Belfast, he has taught at Princeton University for almost thirty years. He is the author of twelve collections of poetry including Moy Sand and Gravel (Faber and Faber, 2002), for which he won the 2003 Pulitzer Prize. His most recent book is Selected Poems 1968-2014 (Faber and Faber, 2016). “Rising to the Rising [Gallery Press, 2016] collects Paul Muldoon’s various responses in English and Irish to commissions from the Irish Writers’ Centre, New York University, RTÉ and others to compose verses to mark seminal moments in a country’s history. They evoke tragic aspects and the aftermath of the Easter Rising of 1916 and the Battle of the Somme just a few months later. You can listen to Jean’s reading here. Jean O’Brien is an award winning poet, having won the prestigious Arvon International and Cork’s equally prestigious Fish International Poetry award. She has been placed or a runner up many times, her most recent being Highly Commended in the Forward Prize in 2014. She has four books to her name The Shadow Keeper (Salmon Poetry, 1997), Dangerous Dresses (Bradshaw Books, 2005), Lovely Legs (Salmon Poetry, 2009) and Merman (Salmon Poetry, 2012). Her New and Selected, called Fish on a Bicycle, has just been published by Salmon Poetry . She has facilitated many Creative Writing Workshops in places as diverse as prisons, schools, community groups, libraries and festivals. She gained an M. Phil in Creative Writing from Trinity College, Dublin and is a former Writer in Residence for Co. Laois. Adam Wyeth is a poet, playwright and essayist. His critically acclaimed collection, Silent Music was Highly Commended by the Forward Poetry Prize. He has been hailed as a ‘poet of ideas exquisitely wrought and swarming, demanding a reader awake to complexity on a subtle scale… The Irish Times say, ‘Silent Music is a clever volume that playfully questions taken-for-granted certainties… a fresh and imaginative voice is evident.’ His poetry has won and been commended in many international competitions, including The Bridport Poetry Prize, The Arvon Poetry Prize and The Ballymaloe Poetry Prize. His work appears in several anthologies including The Forward Prize Anthology (2012 Faber), The Best of Irish Poetry (Southword 2010) and The Arvon 25th Anniversary Anthology. He was also selected as a Poetry Ireland Review Rising generation poet. Adam’s third book and second poetry collection The Art of Dying will be published with Salmon in October/November 2016. Adam’s second book, The Hidden World of Poetry: Unravelling Celtic Mythology in Contemporary Irish Poetry (2013) contains poems from Ireland’s leading poets followed by sharp essays that unpack each poem and explore its Celtic mythological references. He has most recently been published in the new Collins Anthology of Cork poetry, On the Banks (ed. Alannah Hopkin). Adam’s latest collection, The Art of Dying, has just been published by Salmon Poetry. The online programme is here. 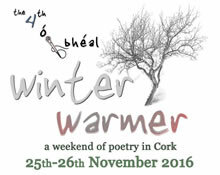 We’re thrilled to announce Ó Bhéal’s fourth Winter Warmer festival weekend. Twenty-two poets will read and perform over two days in the Kino, Cork’s iconic Arthouse Cinema on Washington St. This year’s world-class line-up includes poets from eight countries, Tara Bergin, Josep Lluís Aguiló, Jessica Traynor, Billy Mills, Raina J.Léon, Michael Augustin, Catherine Walsh, Martín Veiga, Elaine Feeney, Ross Donlon, Paula Cunningham and … you’ll just have to see the programme for the other eleven poetry stars. The programme also features a selection of films from the Ó Bhéal Poetry-Film competition, Poetry in Performance Art, Poetry with Music and a closed-mic set for ten local poets. We’d like to say a huge thank you to this year’s festival sponsors, without whom none of this would be possible, The Long Valley Bar, The Arts Council, The Community Foundation for Ireland, The Kino, Farmgate Café, Dunnes Stores, Forum Publications, Arc Publications, Isaacs Hotel, No.5 Fenn’s Quay, Cork City Council, Munster Literature Centre, Poetry Ireland, The Quay Co-op and Café Paradiso. All events are free. Donations are gratefully accepted. You can listen to the readings here. Looking At The Stars is a limited edition anthology of Irish writing edited by Kerrie O’ Brien and Alice Kinsella to raise money for the Rough Sleepers Team of the Dublin Simon Community. Readers confirmed are Pat Cotter, Thomas McCarthy, Jennifer Matthews, Madeleine D’Arcy and Afric McGlinchey. It features a mixture of poetry, prose and non-fiction from a host of incredible Irish writers but, most importantly, it will also feature writing from those currently in the services of the Dublin Simon Community. 1000 copies of the anthology will be printed. They will cost €15 each and as the full €15 will go directly to the Dublin Simon Community our goal is to raise €15,000. Looking At The Stars will be available from 1st November 2016 in Dubray Books, Books Upstairs and The Gutter Bookshop. The anthology will be available to order exclusively online from the wonderful Dubray Books. This project has been funded entirely by The Munster Literature Centre, Dublin UNESCO City of Literature, Poetry Ireland and The Irish Writers’ Centre.